Alaska is a unique land with a correspondingly unique lifestyle that revolves around a northern climate. Each week, I’ll provide a brief synopsis on an Alaska topic that will include some links to photos from my archives. Late May in Fairbanks, Alaska is an infusion in fresh lime green. The boreal forest explodes with shiny new leaves and new grass is growing under the increasing light and sunshine. In particular, this year there is an abundance of snowshoe hares that venture from the forest to feed on the fresh green grass in open areas. Snowshoe hares turn completely white in the winter as part of cryptic color disguise that helps them hide from predators. 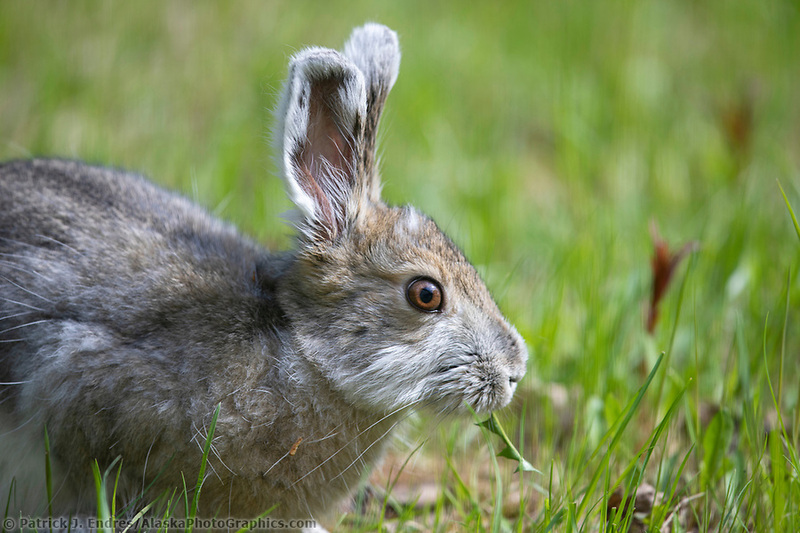 While they are often called “rabbits”, technically they are “hares” which are distinct in that their young, called leverets, are born with a full coat of fur and open eyes. This is in contrast to rabbits, whose young are born hairless and with eyes closed. I took this photo in my front yard the other day. It is likely true for most Alaskan’s, that after 8 months of white, the urge to both see and feel color and heat ramps to an all-time high at the beginning of May. At least in Fairbanks, the snow is in the final melting stages and the buds in the trees are just beginning to appear. As delightful as winter fun in the snow can be, I’m longing to drink in some rich colors and the pleasant warmth of a Fairbanks summer. The cumulous clouds are returning to sparkling blue skies, and the pace of life amps up in accord with the length of light. The hours of a landscape photographer during Alaska’s summers are a bit ruthless to a normal sleep cycle, but they are filled with golden light and rewarding sights. This picture of Denali is a new image I took last summer in Denali National Park. Alaska’s southern shores vary from lush temperate rainforests to rocky cliffs, giant boulder beaches, and broad, flat sandy bars. In the Gulf of Alaska, huge beaches receive the fury of the mighty Pacific Ocean as waves develop over great fetches in the expansive sea. Softuk Bar is a broad sandy beach located near the Copper River Delta. The continual rhythm of waves wash patterns in the broad flat sandy beaches. It is hard to perceive the scope of the symmetry while on the ground, but from the air, it becomes distinctly visible. For a sense of scale, there is a bald eagle perched on the shore in the bottom right of the picture, although difficult to see. The small community of Cordova, Alaska hosts a shorebird festival in early May to commemorate the epic bird migration through the Copper River Delta, situated on the eastern shores of Prince William Sound. The region serves as a major refueling stopover for many shorebirds, including the tiny Western Sandpiper, who are flying to their nesting grounds further north and west in Alaska. Watching flocks of shorebirds rise and fall like swarms of bees, moving along the muddy flats looking for food is a visual and audio experience. The muddy tidal flats are long at low tide, providing the birds’ access to a rich food source. Once the tide rises and water covers the intertidal zone, the birds congregate in tight groups to rest creating a carpeted pattern of beautiful feathers. Alaska has an abundance of glaciers, although most of them are receding at a rapid rate due to increasingly warmer temperatures. The melt runoff from these glaciers forms streams and rivers that flow under the giant mass of ice above. As the temperatures increases during the summer months, the underlying rivers rise with a gray silty water that sculpts the surface ice above. In the winter, when the water ceases to flow, the water-hollowed ice caves can be accessed relatively easy. The arched, icy ceiling is sculpted in scalloped cups, sometimes radiant blue, and often decorated with frosty ice crystals. Although organic pieces of nature’s art, they can have unstable areas under your feet and overhanging rock above so they should be approached and entered with caution. The rustic log cabins found throughout Alaska are a diverse demonstration of how many Alaskans still stay connected to a more “simple” life. Some log cabins have historic significance, dating back to the pioneer days of the gold rush era. Others are more contemporary and are utilized for recreational activity in both winter and summer seasons. Most are built with a simple style, without running water and a conventional septic system. The accompanying outhouses are a colorful commentary and have been the subjects of several books. I make frequent trips to my quaint little cabin in the Alaska Range mountains which serves as a tremendous gateway to explore, photograph, and play in the nearby mountains. Every March Pacific Herring migrate to their spawning grounds in the calm waters of Sitka Sound, off Baranof Island in Southeast Alaska. This draws not only the whales, sea lions, and other marine mammals who feed on the fish, but also a fleet of fishermen. The Stika Sac Roe Herring Fishery is a commercial fishery consisting of a handful of opening periods over the span of a few days. The fishery is managed by the Alaska Department of Fish and Game, and a quota is established based on current numbers. A fleet of purse seiner fishing vessels compete for the best fishing spot using the aid of small planes that supply aerial surveillance information on fish school locations to the vessels below. Muskox are one of the most prehistoric looking animals I’ve ever photographed. They populated Alaska during the close of the Pleistocene era but went extinct sometime in the mid-1800’s. Thanks to a reintroduction program, they now inhabit Alaska’s Arctic once again. Their underfur, also known as qiviut, is a dense wool-like fur that holds tremendous insulation value. Single muskox calves are born in the early spring, from April to June and they grow quite rapidly while feeding on the sedges, grasses, and plants of the tundra. In Alaska, Muskoxen can be photographed on the Arctic North Slope, in regions around Nome, and on Nunivak Island. Sea otters inhabit Alaska’s southern waters from the eastern Inside Passage to the western Aleutian Islands. They are well loved because of their cute, furry bodies and dextrous little hands. They can often be seen grooming their fur (the densest fur in the animal kingdom) which insulates them from the chilly waters. The Russian fur trade nearly decimated the population in Alaska and waters further south in the early 1900s and they are still listed as Endangered on IUCN Red List due to declining populations. Sea otters eat shellfish, urchins and several other small marine species and can consume up to 25% of their body weight a day in food, and that is a lot for a 40-60 pound animal! March is not the only month of the aurora borealis season, but it is one of the year’s most geomagnetically active solar months. Combine this with Fairbanks, Alaska’s northern location, and often clear skies, and you have the beginning ingredients for successful aurora viewing. Fairbanks is gaining popularity as one of the best places to view and photograph the northern lights in the U.S., and some argue the world. Make sure you come prepared for cold weather, check the aurora forecasts, stay up between 10 pm and 2-3 am, bring a camera and tripod, and have fun hunting the night skies for some colorful curtains of light.